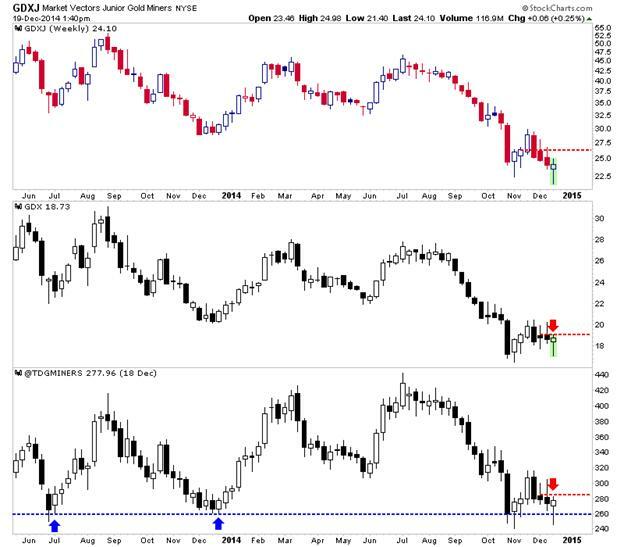 The gold and silver stocks have put in a bullish weekly reversal but Gold and Silver have not confirmed it. The interplay between the metals and the shares has been complicated in recent weeks. Hopefully this missive will make some sense of it as the two groups are sending mixed signals. 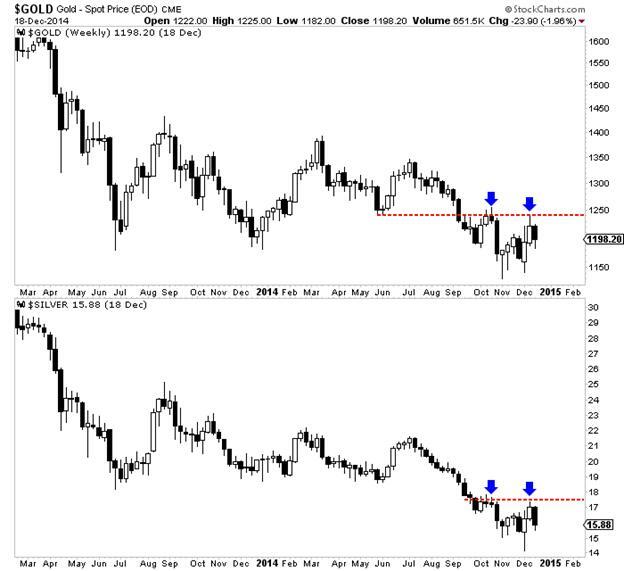 Gold and Silver are charted below in weekly candle format. Before this week the metals looked bullish. Each tested support and rebounded strongly towards resistance. However, both metals gave back much of the recent gains. Bulls would say they are correcting and still in position to test resistance. Bears would say the metals failed to reach resistance and are headed to new lows. Though the mining stocks are selling off today (Friday), they’ve completed a bullish reversal and double bottom on most weekly charts. Below we plot GDXJ, GDX and our Top 40 index. Other than GDXJ just about every miner index has completed a double bottom. Though GDXJ made a new low it did form a bullish reversal. GDX and the Top 40 index formed bullish hammers and potential double bottoms. We say “potential” double bottoms for a reason. The double bottom is a very bullish pattern in which the market should explode up from the second bottom. Only time will tell if the miners follow that path or if the reversal fizzles. Interestingly, the metals and the miners have been disjointed in recent weeks. Gold lost 2% this week while Silver lost 6% yet the miners put in a positive reversal. During the two prior weeks metals rebounded strongly yet miners sold off. Part of that could be tax loss selling in the miners which has created additional weakness. Investors and traders have a good setup in the miners. Downside support is defined by the double bottom. A weekly close below that could be the stop out point and would limit losses. Meanwhile, if the metals are destined to take out their October highs then the miners should explode higher sooner rather than later. After 2013 tax loss selling, GDXJ rebounded over 50% within two months. We are working hard to prepare subscribers for this opportunity.